These deaths are all 100% preventable, yet every year we lose hundreds of lives to sunstroke when we didn’t have to lose one. 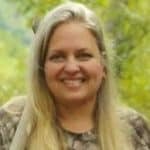 Why do we lose so many victims? I believe it is from lack of education. 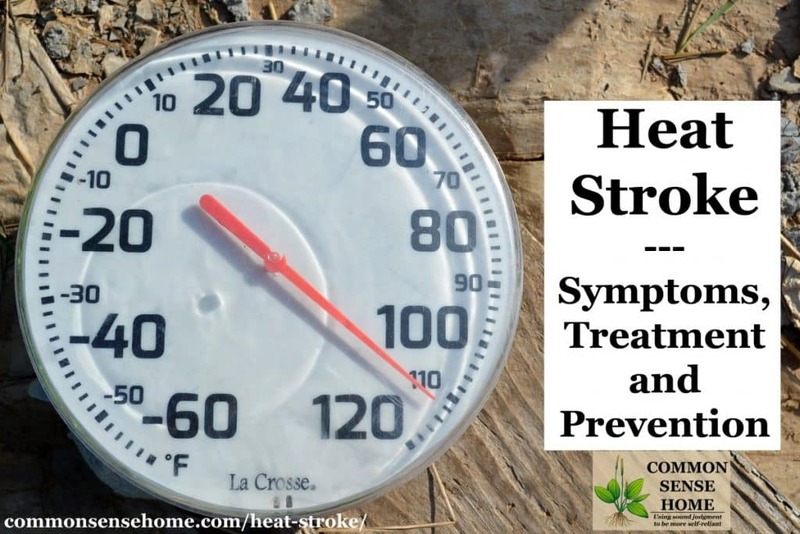 We need to know the symptoms of heat stroke, who's most at risk, prevention and treatment options. Note: See the post “12 Best Tips for Keeping Your House Cool without AC” for ideas on how to keep your home cool during extreme summer temperatures. 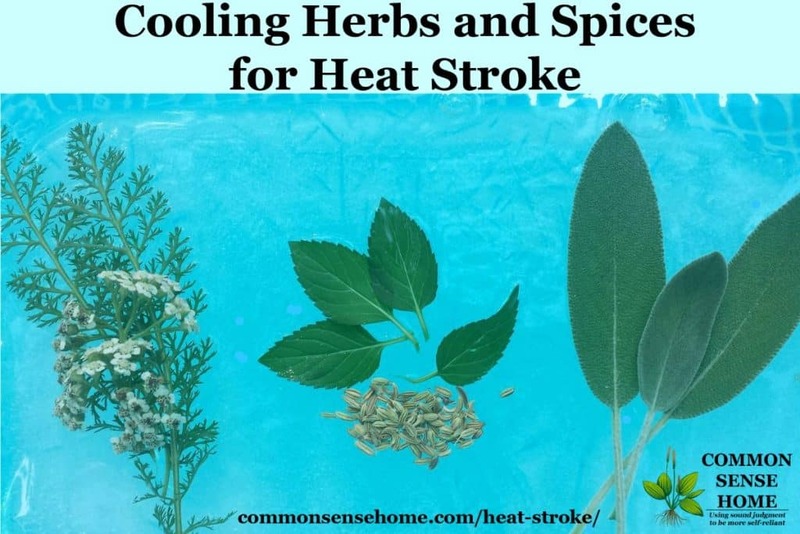 Heat stroke is a condition marked by fever and often by unconsciousness, caused by failure of the body's temperature-regulating mechanism when exposed to excessively high temperatures. At the first sign of suspected stroke, Call 911. Any delay in treatment could result in death. Please be careful! The operator may be able to guide you through first aid until paramedics arrive on the scene. If you are unable to contact an emergency worker, it is important to try to lower the person’s core temperature. Heat stroke can cause brain damage and organ failure. The quicker you can lower the core temperature, the better the chance the patient has at survival. Apply cool, wet cloths all over their skin. Rinse cloths under cold water, ring out and place on skin. Fan air over patient by turning fan on and placing it close to the person. Apply ice packs on the hot spots: armpits, groin, neck and head. If the temperature does not come down, you can place patient in an ice bath in the tub, or a cold shower. Avoid the heat from 2-4 pm. 3 pm is the hottest part of the day. If you have to work outside get your work done before noon or after 4 pm. Never stay in a parked car or leave anyone (including pets) in a car during the summer, even for 5 minutes. Take it easy. Don’t do too much in the heat or overexert yourself and take lots of water breaks. Stay hydrated. Most heatstroke victims are accompanied by dehydration. Avoid alcohol, caffeinated drinks or drinks high in sodium. Hydration is vital to our overall health and well-being. In addition to helping the body function properly, water helps regulate body temperature and flush out waste. Getting enough water and fluids help maintain your blood pressure and ensures your tissues get the oxygen, nutrients and hormones from your bloodstream they need to function. If you suffer from dehydration, your tissues can’t work effectively. 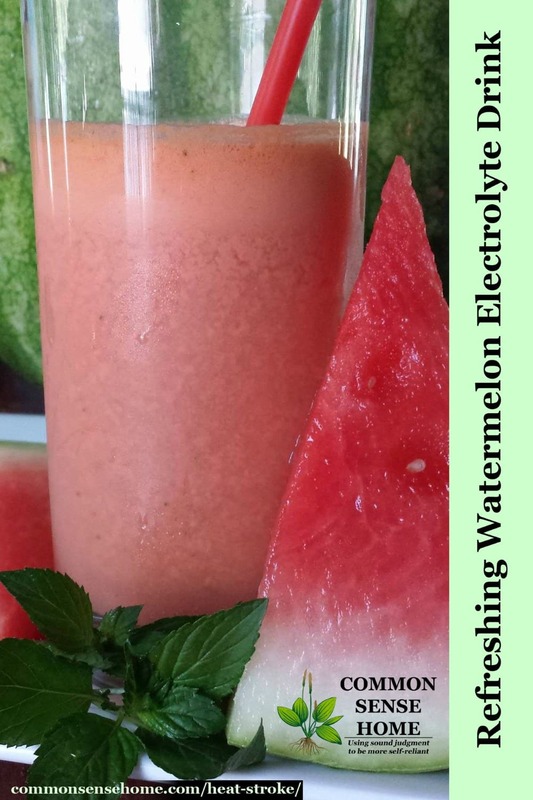 Watermelon is an excellent source of electrolytes, Vitamin A and C, and this recipe teams it up with refreshing herbs and other needed minerals. Place all ingredients in a blender, chill and enjoy. Wear Lighter Clothing. Wear loose-fitting clothing preferably made of cotton or linen which absorb moisture. Wear light colors that reflect the sun, dark colors absorb the sun and make you hotter. If you can hold an article of clothing up to the light and see through it, then it’s a good choice. Hats – Wearing a wide brimmed, light-colored hat can help keep you cool and provide shade. Cool Your Clothes. Wear short sleeves, buy clothes with built-in ventilation, or you can even put your clothes in the freezer prior to going outside for extra cooling comfort. Put your hair up. When it’s blistering hot outside you have to opt for comfort over fashion. Keeping your hair off your neck will help keep you cool. Shoes – Wear open shoes like flip flops or sandals. If you wear closed toe shoes, wear cotton socks to absorb moisture. If you must work in extreme temperatures for an extended period of time, you may want to consider a cooling vest for industrial use or cooling vest with rechargeable inserts. Peppers – Ever wonder why the spiciest foods tend to come from hot weather cultures and grow best in the heat? It’s all part of the grand design – peppers are popular in hot countries because they cause sweating and activate a whole raft of mechanisms which lower the body temperature. Warm (Heated) Foods – Martial Arts Master, Gichin Funakoshi, wrote about his secret to good health in his biography. His secret was eating hot foods when it was hot and cold foods when it was cold so your body was always in balance and not struggling to maintain its temperature. We now have scientific evidence to prove what Master Funakoshi knew all along. Peter McNaughton, a neuroscientist at the University of Cambridge, stated that nerves in the tongue have a lot of one particular receptor that responds to heat. When you eat or drink something hot, the brain gets the message “It's hot in here,” and it turns on the mechanism we have to cool ourselves off: sweating. The hot drink somehow has an effect on your systemic cooling mechanisms, which exceeds its actual effect in terms of heating your body, says McNaughton. Excerpt from “Cool Down With A Hot Drink? It's Not As Crazy As You Think“. Herbs and Spices. Herbs and spices can help cool the body naturally. The next time you feel the temperature rising, turn to the garden or the spice cabinet. Sage (Salvia Officinalis) Sage has a strong anti-hydrotic action, and was a traditional treatment for night sweats and reducing fevers. Sage is also good for the nervous system when it’s been aggravated by heat. Make a warm or cold sage tea with a bit of honey for a nice cooling effect. Mint (Mentha) Mint provides a cooling effect that reduces inflammation and soothes. Methanol, an organic constituent of mint activates the cold receptors of your skin. Add mint to your tea, vitamin water or just chew on a couple of leaves. Yarrow (Achillea Millefolium) Yarrow regulates the fluids in the body, cooling or heating as needed by moving blood toward, or away, from the skin’s surface. Yarrow also helps regulate body temperature which aide in keeping cool during the heat of the summer. Fennel (Foeniculum) Fennel seeds aid in digestion after a heavy meal by helping break down food and reduce flatulence. Enjoy a couple of fennel seeds before or after a meal to help cool the body down, as an extra bonus – fennel helps remove bad breath. 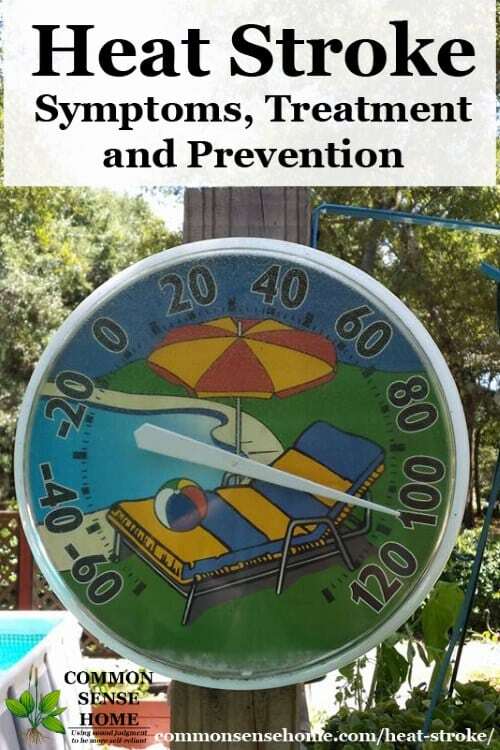 When high temperatures move in, make sure you take appropriate measures to beat the heat and stay safe, and watch out for others who are most at risk like children or elderly neighbors. Share this information and help prevent needless loss of life. Thank you for this article. I live in SC and we’ve been in the triple digits pretty much everyday since summer began. I’m so over this summer heat (my least favorite season here). It was 106 yesterday but of course the very high humidity made it feel much worse. Night time doesn’t bring much relief either, it was 92 degrees last night at 9pm. Amber is in South Carolina, too, and she and I chat most days. In the winter I’m jealous, but this summer has been hot, hot, hot!